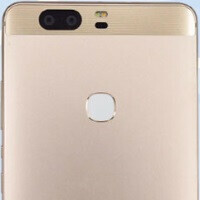 Around two years ago, Chinese smartphone big-shot Huawei was openly reserved about the benefits of Quad-HD resolution mobile displays. CEO Richard Yu reasoned that ultra high-res screens consume too much battery power while not presenting visible benefits to customers at the time. But times have changed, mobile VR headsets are starting to break into the wider consumer electronics market, and 1080p resolution doesn't quite cut it for a truly immersive experience. Huawei itself is looking to enter the VR market with a viewer of its own, a device similar in style and execution to the Samsung Gear VR. Honor, which is a Huawei brand operating independently, probably has something related in mind. This might explain why a stand-out feature of the upcoming Honor V8 smartphone is its 5.7-inch 1440 x 2560 screen. The device just passed through the TENAA certification process and showed up in photos which reveal its design, along with some spec sheet information. The smartphone is said to ship in both 1440p and 1080p resolution variants, powered by a Kirin 950 or 955 chipset with 4GB of RAM and 32GB or 64GB of expandable storage. There's also a 12MP dual camera/8MP front camera setup, while the battery is of 3400mAh capacity.The device has a metal body and is painted in Gold and Pink, though we assume the phone will be offered in more traditional black and gray/silver choices as well. All glory to the dual cam! Honor has already teased the V8 on its website, and with its TENAA certification complete, it looks like the smartphone is prime for a reveal early next month. Honor handsets have debuted in Western markets, attacking established brands like Samsung and Apple's presence with aggressive price tags. The V8 might show its face outside Asian markets as well, though the company's distribution plans remain unclear for now. Is it me or the affordable honor series always looks better than the expensive P models? Who gives a f**k, it's Huawei. I always thought that the Honor line will be their affordable offering. I wonder how they will price these. Quad HD and Kirin chipset is a disaster waiting to happen.